The South Carolina House of Representatives is the lower house of the South Carolina General Assembly, the upper house being the South Carolina Senate. It consists of 124 Representatives elected to two year terms at the same time as US Congressional elections. Unlike many legislatures, seating on the floor is not divided by party, but is arranged by county delegation. This is a legacy of the original apportionment of the chamber. Until 1964, each county was a legislative district, with the number of representatives determined by the county's population. Representatives are considered part-time citizen legislators who serve two-year terms. Representatives are elected at-large by their district, and there are no term limits. Representatives must be 21 years of age before they are eligible to become a representative. (a) 21 were members of the Union Reform Party of South Carolina and the other 3 were Independents from Anderson. Two of the Union Reform members from Chesterfield were later replaced by Republicans from a resolution passed in the House. (b) All 33 were members of the Conservative Party of South Carolina. (c) All 17 were Independent Democrats. 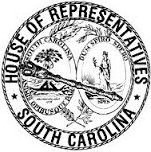 ^ "South Carolina Legislature Online - House of Representatives". www.scstatehouse.gov. Retrieved 20 June 2018. ^ "Candidate Qualifications - SCVotes". www.scvotes.org. Retrieved 20 June 2018. ^ "University Libraries - University Libraries - University of South Carolina". library.sc.edu. Retrieved 20 June 2018. Kalk, Bruce H. (2001). The origins of the southern strategy: two-party competition in South Carolina, 1950–1972. Lexington Books. ISBN 0-7391-0242-7.